Botanical Significance: Debate abounds as to whether the trees depicted here is cacao or another tree that produces fruit on its truck. “Probably due to poor conditions of preservation, no traces of cacao have been found at Teotihuacan itself, but one carved vase fragment from the city shows a blowgunner-perhaps one of the Hero Twins-shooting birds perched in a cacao tree,” (Coe and Coe 1996, p. 54) Is it possible that the tree represented is not a cacao. They must be shooting birds from a taller tree such as Pouteria sapota. Blow guns of this length were most likely not used for shooting animals at such a close distance for the average height of the cacao was only 18’. 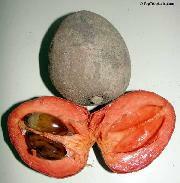 Plus the shape of the fruit is similar to that of Pouteria sapota not of Theobroma cacao. It is possible that this tree is represented in Maya art more often than orginally thought.